(b) The head office of the society will be located within the territorial jurisdiction of the Karachi District. The Society may have local chapters at suitable places inside Pakistan. Facilitate research in all disciplines of Economics and Applied Economics. Perform all such acts as are conducive to the attainment of the above-mentioned objectives. All members of the International Advisory Board of the Applied Economics Research Centre . All members of the International Board of Editors of the Pakistan Journal of Applied Economics – the bi-annual journal of the Applied Economics Research Centre . All professional staff in the research and teaching / training wings of the Pakistan Institute of Development Economics. Master’s degree in all disciplines of Economics / Applied Economics, Business Administration, Public Administration, , Statistics, Econometrics and /or an evidence of proven scholarship in these areas of Specialization. (b) All persons satisfying the minimum eligibility criteria as specified in Bye-law No. 6(a) above may apply for Member-ship on prescribed forms after having their nominations duly proposed and seconded by any two Ex-Officio Members/ Members of the society, provided that no such applications shall be required of a former Ex-officio Member who may enroll as Member on payment of the prescribed fee at the invitation of the Executive Council of the Society. 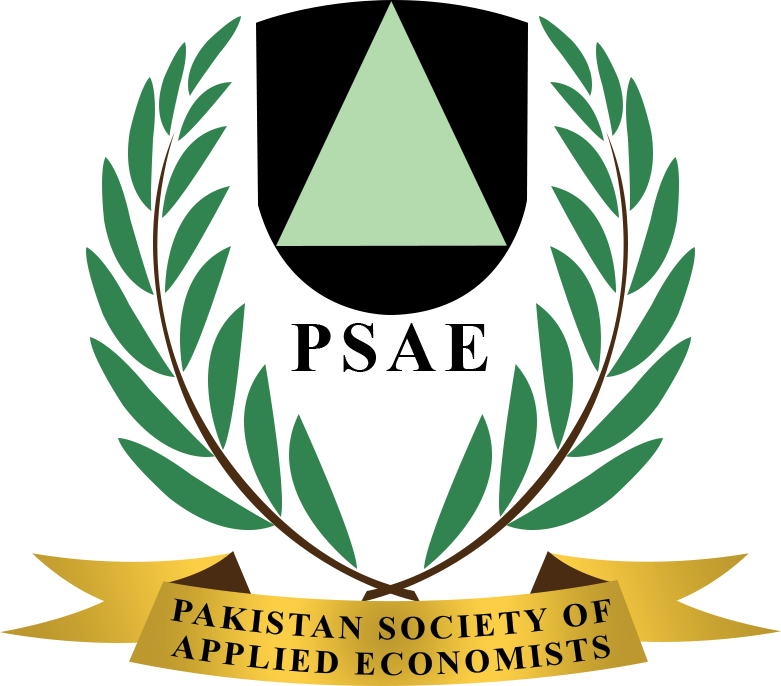 (c) The President of the Society shall approve memberships of the Pakistan Society of Applied Economists. (d) The annual fee for the members for each calendar year shall be Rs. 1000/= each for members inside Pakistan and US $ 100.00 each for members outside Pakistan, which would include subscription to the PJAE, and payment for the Publications of the society as per Bye-law No. 50. It shall be payable in advance each year. termination of his association with the Applied Economics Research Centre in such capacity as entitled him to the Ex-officio Membership of the Society. Resignation of his own accord. (c) Any Member/Honorary Life Member may at any time file his/her resignation in writing to the Secretary of the Society. (d) The Term of office of the Members on the Executive Council shall be two years. No Member shall serve on the council for two consecutive terms. The liability in the case of Members shall be ten times the amount of fees paid by them yearly while it shall be nil in the case of Ex-officio Members and Honorary Life Members. on termination of his association with the Applied Economics Research Centre that entitled him to the Membership of the Council of Fellows or the Ex-officio Membership/ Membership of the Society. To exercise all such powers and perform all such acts as may be necessary for promoting the interest of the society. In addition to the Patron-in-chief and the President, the society will have a Secretary. Fix the price of the publications of the Society. The Governing Council shall meet at least once a year or at other times when convened by the President of the Society in consultation with the Patron-in-Chief of the Society. The meetings of Executive Council and Governing Council shall be held at the registered address of the Society. The Executive Council shall meet at least once in a year or at other times if the President deems it necessary or will meet if a written demand is made by one-third of the members of the Executive Council to call a meeting. For holding a meeting of the Executive Council, a minimum notice of fifteen days shall be required. The Secretary of the Society shall issue the notice after its approval by the President of the Society. One-third of the members of the Executive Council shall form the quorum for its meeting. Amendments of bye-laws shall only be carried out by two-third of the members present at a constitutionally valid meeting of the Executive Council at which a Quorum shall be present. All other matters shall be decided by a majority of votes. In case of a tie, the President shall exercise the casting vote. Each member shall have only one vote. No proxies shall be admissible. The Annual General Meetings of the Society shall be held under the aegis of the Applied Economics Research Centre. At least 15 days notice of the Annual General Meeting shall be given. The notice shall be mailed by the Secretary after its approval by the President to Ex-Officio Members, Honorary Life Members and Members. Such notices shall specify the date, time and place of the meeting and contain summary of the agenda to be considered for disposal of business at such meetings. All business discussed or decided shall be recorded at the minutes of the meetings circulated among members for their information and approval. No matter shall be discussed which has not been included in the agenda provided that the President may, in case of an emergency, permit the discussion of such fresh matters when the majority of the present members so desire. To commemorate the memory of the Father of the Nation the society will institute the Quaid-i-Azam Lecture series on Applied Economics. The Lecture may be held annually at the Annual General Meeting of the Society. The Lecture will be followed by an open discussion. Only Scholar of international repute who have made outstanding contributions to the advancement of scientific knowledge in the general area of Economics / Applied Economics and its related field shall be invited for delivering the lecture. Topics for the Lecture will be decided by the Executive Council of the Society each year at least six months prior to the delivery of the lecture. The lecture should be based on unpublished research findings of the scholar. A written draft of the lecture must be submitted by the Scholar to the President of the Society in Advance. The Scholar invited for the lecture will be offered Honorary Life Membership of the Society on acceptance of the invitation to deliver the lecture. The Scholar invited for the Quaid-i-Azam lecture will be provided with First class return air-ticket, fully paid hotel accommodation and US$ 1,500.00 honoraria in local currency. The Scholars invited for invited lectures will be provided with Economy Class return air-ticket, fully paid hotel accommodation and US$ 8,00.00 honoraria in local currency. The Applied Economics Research Centre / Pakistan Society of Applied Economists shall have the copy-rights for the publication of the lecture and the discussion proceedings. To commemorate the memory of the Great Academician and Scholar Philosopher, the Society will institute the Sir Syed Ahmad Khan Memorial Lecture series on Applied Economics. The lecture may be held annually at the Annual General Meeting of the Society as well as during the course of the year. The lecture will be followed by an open discussion. Only Scholars of international repute who have made outstanding contributions to the advancement of scientific knowledge in the general area of Applied Economics and its related field shall be invited to given the lecture. The Scholar invited for the lecture will be offered Honorary Life Membership for the society on acceptance of the invitation to deliver the lecture. The Scholar invited for the Sir Syed Ahmad Khan Lecture will be provided with Economy class return air-ticket, fully paid hotel accommodation and US$ 1,500.00 honoraria. The Applied Economics Research Centre / Pakistan Society of Applied Economists shall have the copyrights for the publication of the lecture and discussions proceedings. To commemorate the memory of the Great Sufi Poet Scholar of Sindh , the Society will institute Memorial Lecture series on Economics / Applied Economics. All money received for and on behalf of the Society shall be deposited in a bank approved by the President. All payments shall be made whether in cheque or in cash out of the imprest. The bank account of the Society shall be operated jointly by the President and the Secretary. All cheques or other instruments executed on behalf of the Society, Expects receipt, shall bear the signature of the Secretary and the President. Any other account books or register prescribed by the Executive Council of the Society. The Executive Council shall appoint one or more of its members to take, hold and keep in safe custody all registers and documents prescribed in Bye-law No. 48 above. The Society shall publish proceedings of the Annual General Meetings and occasional papers, edited jointly by the President and the Secretary of the Society. All members shall agree in writing at the time of admission to abide by all the bye-laws and regulations of the Society and all amendments and modifications thereof which may be made from time to time. In case the mentioned agreement is not executed by a member through oversight or otherwise, or the agreement is lost or is found defective in any way, it shall be presumed that the agreement has been duly executed. Every member shall, therefore, be bound to abide by the bye-laws and rules and regulations of the Society. The accounts of the Society shall be audited at least once a year by an auditor appointed by the President of the Society. The Society may be liquidated by a resolution passed by three-fourth of the total number of the members of the Executive Council only at a full session of the Council. This decision will not be effective it is ratified by a full session of the Governing Council of the Society by at least three-fourth of its members. After discharging the liabilities of the Society and surplus funds shall be applied to such local of public utility as may be selected or approved by the Executive Council by the votes of not less than three-fifth of the members present at the time of the dissolution of the Society.